It has come to the attention of IOP Publishing that some of the data in this paper appears to have been fabricated. The Editorial Board has investigated this and found that the XPS spectra shown in figure 3 all exhibit an identical noise pattern that is unphysical and is inconsistent with the different samples being investigated. Consequently, this paper has been retracted by IOP Publishing. The first author of the paper, R. K. Singhal, appears on neither of those lists. He declined to sign the notice, the IOP tells us. We asked him for comment, and will update with anything we learn. The paper has been cited seven times, according to Thomson Scientific’s Web of Knowledge. Update, 10/1/13: The Brazilian authors of this paper give some details on what happened (in Portuguese). Slowly, but surely, spectroscopy comes under the same spotlight as western blots and some electron microscopy. As we get better at identifying these issues, the number of retractions will rise, though until journals take a proper stance (as IOP has here), we will continue to get ‘corrections” when it should be a retraction. Good to see IOp use the correct work, too: ‘fabrication” rather than groping for some laughable euphemism. Something could produce estradiol E2 at 60g/ml > 26g/ml of the heaviest metal Osmium. The figure 1 in Papers (1) and (2) are identical. 3) PMID: 11334907; Figure 1. 4) PMID: 11821100; Figure 2. 5) PMID: 16758350: Figure 1. How many photographs have been re-used? What I presented here should mean something. Scientific data go GREEN: Recycling. 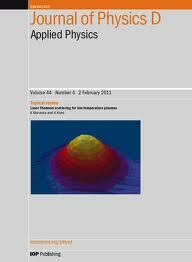 A physics paper retracted because some of the data are “unphysical.” Weer een juweeltje in Retraction Watch! It would seem that Dr. RK Singhal of the University of Rajasthan is facing rather more serious charges (involving some photo-shopping) than merely the retraction of an unphysical physics paper. I have not been able to access any of his or the University websites. I fear the reaction of the Brazilian authors did not seem right to me as they claim no participation on the paper when it got exposed and retracted but they claimed full responsibility for it when the time was to stamp it on their CVs. So one is a real author only when things seem OK? I would bet the same authors tried to prevent the retraction and public exposure before the retraction. Why have not issue an authorship correction during investigation then. It is remarkable how their public statement (not a retraction) begins by boasting how grand their image in the field (supposedly) is. I guess “a pattern that is unphysical” is just one way off saying (some of) the authors fabricated data. It seems that their method of fabrication (take a curve, duplicate it, give it a different color, and say it’s a spectrum from a different compound) is rather un-sophisticated. It probably should have been caught by the reviewers of the paper or the editor. I doubt that this will remain the only retraction. The Applied Physics Letter (Ref 4 of the retracted paper) by some of the same authors, also contains suspect XPS spectra, while the M-H curves in that paper are identical (including noise) as those in Fig 2a of the retracted paper. Only the y-scale has been changed and the ferromagnetic behavior is ascribed to the vacuum annealed CeO2 instead of the hydrogenated CeO2 in the retracted paper. Previous Previous post: What happens to postdocs sanctioned by the ORI?